I’m getting ready to check out and fly off to Mexicooooo here in a few days. 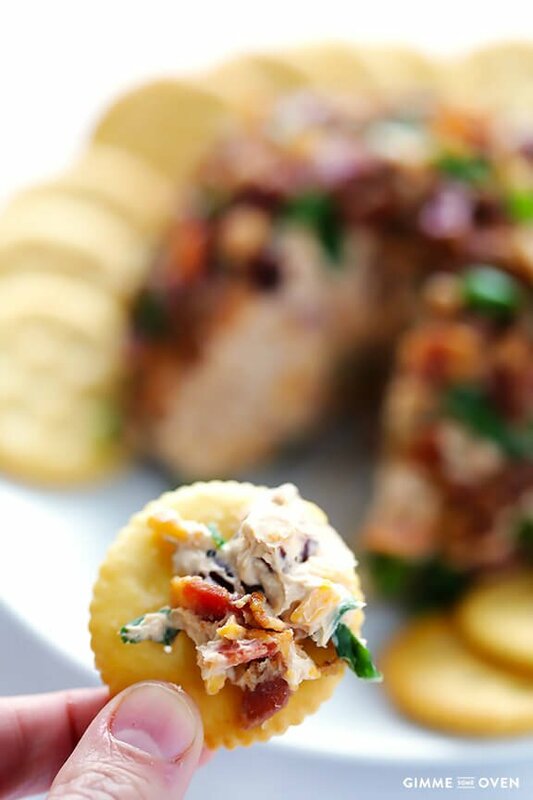 But before I go, I thought I would squeeze in one final appetizer recipe here, just in case there are any procrastinators out there (like me) who have yet to plan their holiday menu. 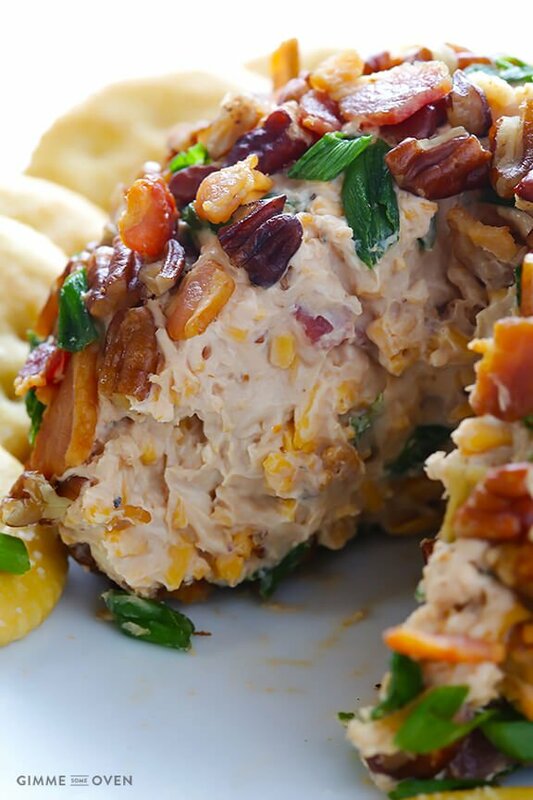 Really, this irresistible cheese ball recipe would be perfect any ol’ time of year. (It has already earned a guaranteed spot on my Super Bowl menu this February!) But since it is red and green, it gets my vote as a favorite new Christmas appetizer. Why? First off, it is the perfect combination of sweet and savory and salty, which is my favorite kind of delicious. Seriously, could not stop snacking on this thing. Second, it only calls for 6 ingredients. Well, it was going to be 5, but then I decided to roll it in some pecans at the last second. So 5 or 6 ingredients, your choice. Third, it only takes about 10 minutes total to prep (plus extra time to chill), and can be made in advance. Finally, it is downright TASTY. So let’s get to it. 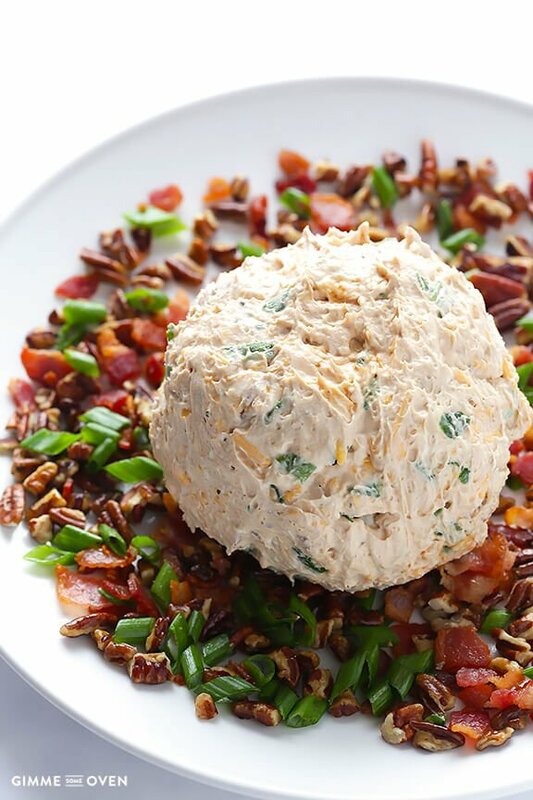 Like with most cheese ball recipes, this one couldn’t be easier to make. Start with your main 5 ingredients — a softened block of cream cheese, some crispy bacon, shredded cheddar, green onions, and your favorite bbq sauce. I prefer this homemade bbq sauce recipe of mine, but anything store-bought will also do. 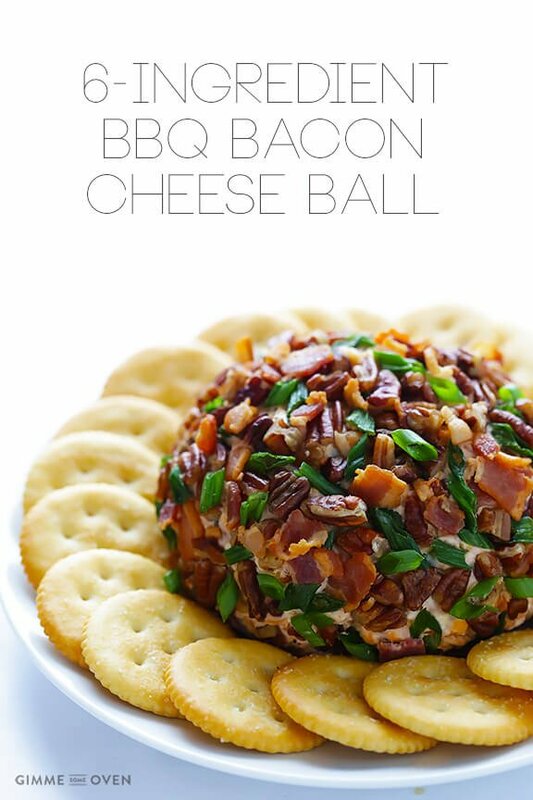 Just keep in mind that the sauce provides the main seasoning for this cheese ball, so choose one you like! To make the cheese ball, just stir all of these ingredients together. Then plop them in a lump in the center of a big sheet of plastic wrap. Shape the lump into a ball, and wrap it tightly with the plastic, then refrigerate it for an hour or two until it is (at least mostly) firm. Ok, I might have gotten a little carried away with the macro photo here, but there’s the inside of this puppy. Happy cheese-balling, and merry Christmas to you all! 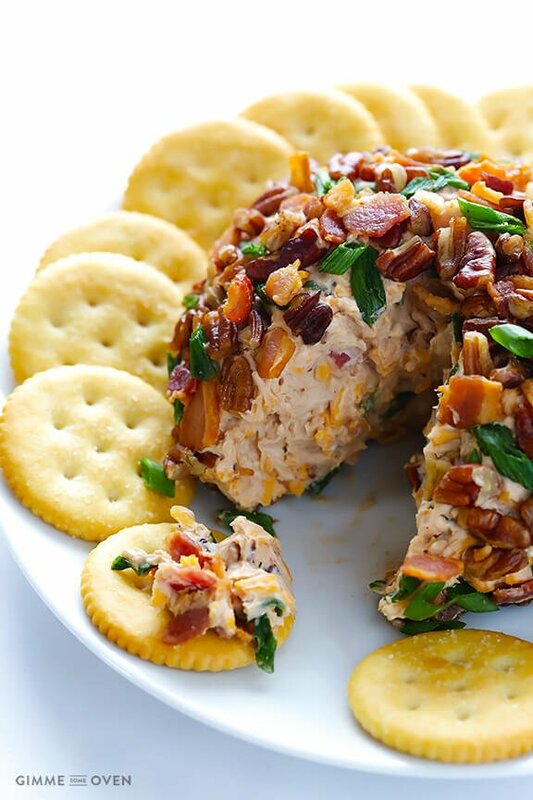 All you need are 6 ingredients to make this delicious, sweet and savory BBQ Bacon Cheese Ball! 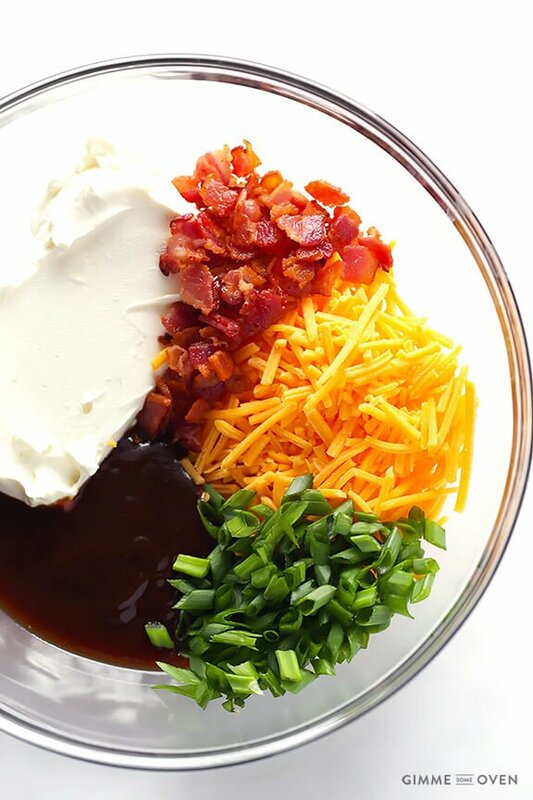 Add half of the bacon, half of the green onions, cream cheese, cheddar cheese and bbq sauce to a large mixing bowl. Stir together until evenly combined. Taste the mixture and season with a pinch of salt and pepper if needed, stirring the mixture once more to incorporate it. Transfer the mixture to the center of a large sheet of plastic wrap. Form into a ball and wrap tightly with the plastic wrap. Refrigerate (or freeze) for at least 1-2 hours, or until mostly firm. 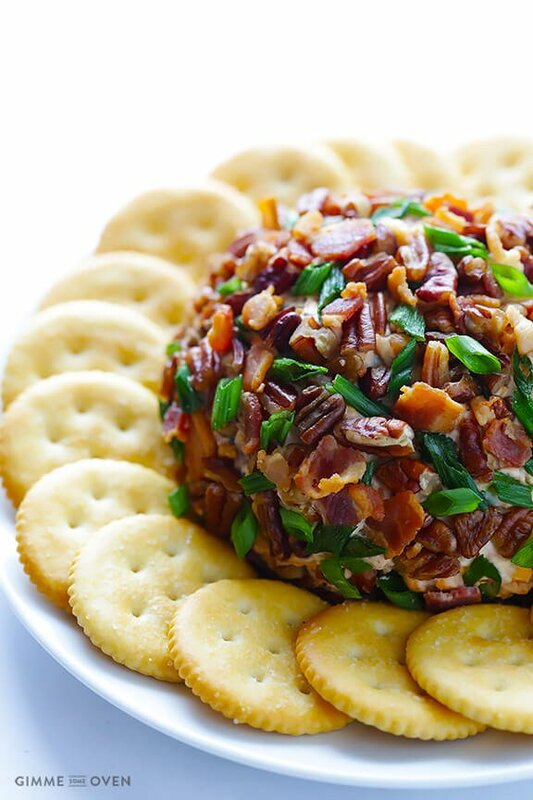 Add the remaining bacon, green onions and pecans to a large plate, and use your fingers to combine them. 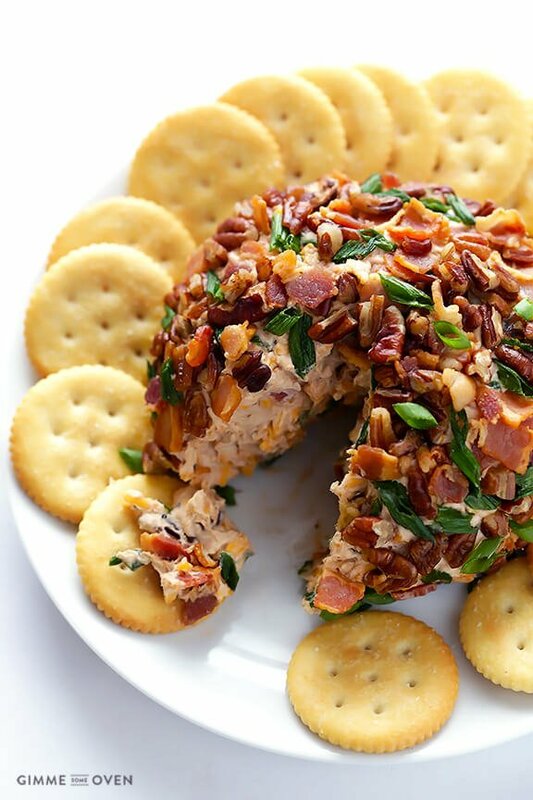 Unwrap the cheese ball and place it in the center of the plate. Then gently roll the ball around until it is coated with the bacon mixture. Serve immediately with crackers or vegetable sticks for dipping. 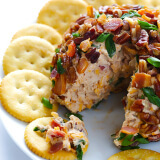 Or wrap and refrigerate the cheese ball again until you are ready to serve it.